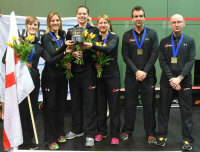 England claimed a double in Warsaw as their women's team retained and their men's team regained the European Team titles. 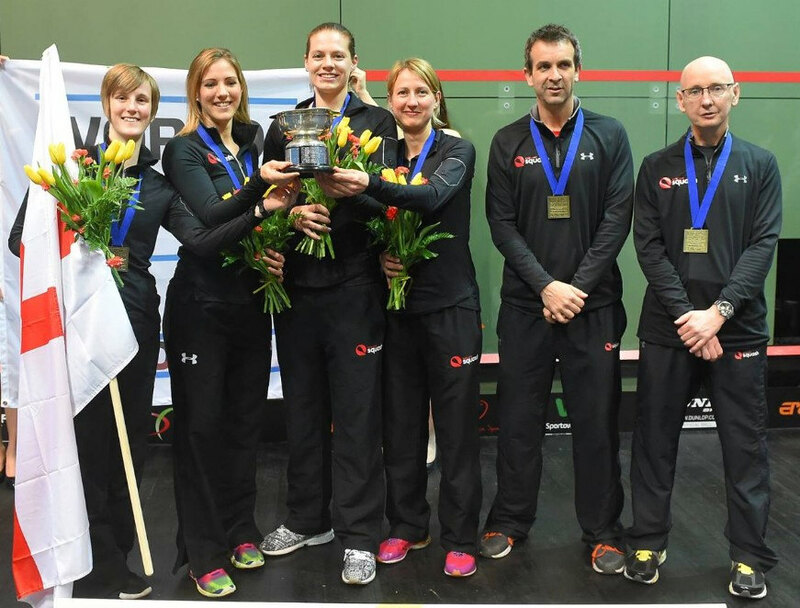 Playing France in the final for the third year in row the English women went two up thanks to wins from Victoria Lust and Laura Massaro to take a 38th title in 39 years of the tournament. England's men were playing France for the 9th final in a row and were keen to avenge last year's solitary loss. 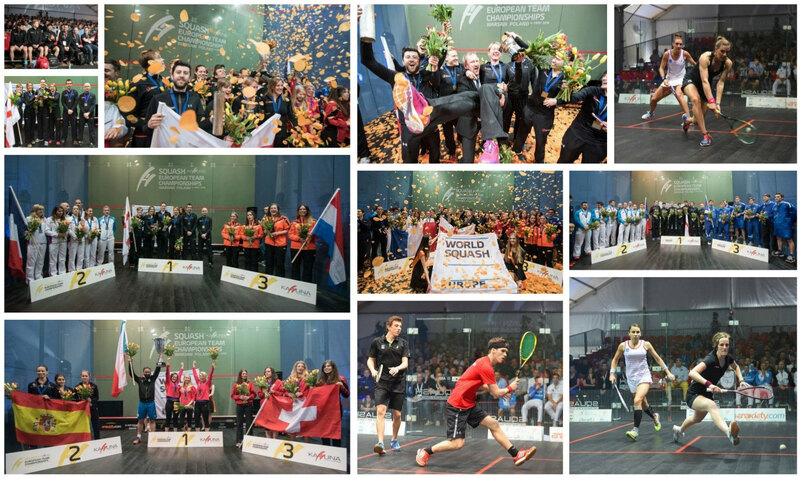 Chris Simpson, who played the final match last year, got England off to a good start with a straight games win, then Gregory Gaultier levelled for France but James Willstrop took a game which proved to be vital. Tom Richards took the third match in straight games to give England an unassailable lead and the English double was confirmed. 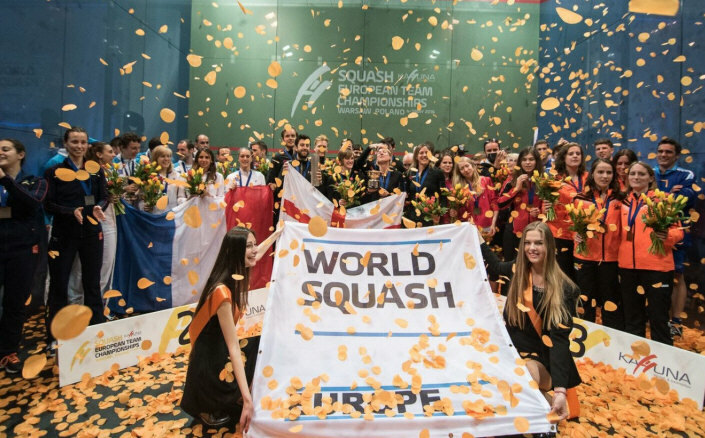 Both finals will be repeats of last year as England and France won their semi-finals in the women's and men's events. In the women's semis England went 2-0 up over Netherlands to take a winning lead, and France did the same against Wales to reach a third successive final - for England it's 38 in 39 events. 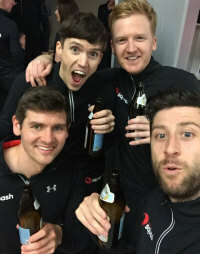 The French men - without the injured Mathieu Castagnet - eased past a German team who rested their number one, then England went 2-0 up against Scotland before Greg Lobban gave the Scots hope by going 2-0 up against Chris Simpson. 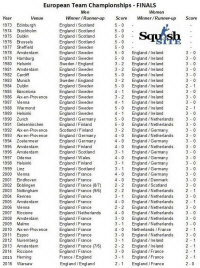 When Simpson levelled, England had more games than the Scots could muster so the match was stopped. 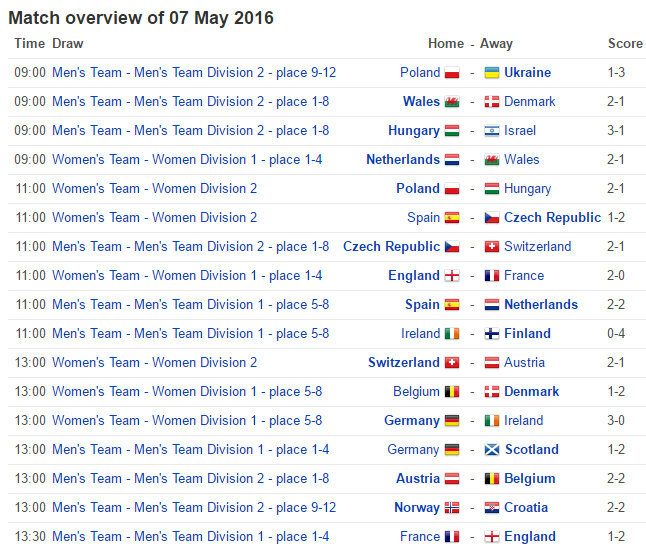 A much quieter day in Warsaw, as the semi-finalists in both divisions were decided. 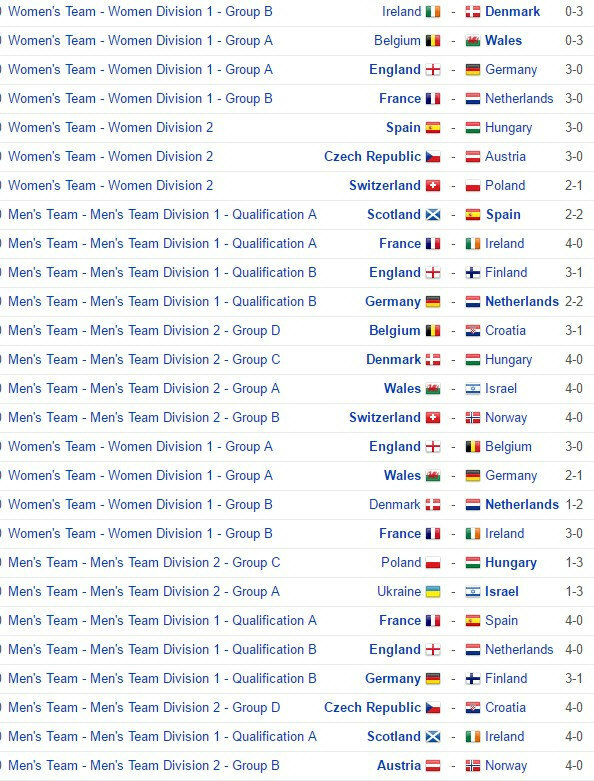 In Women's Pool A top seeds England beat Wales 2-1 to settle the top places, while in Pool B France beat Denmark 3-0 to top the group while Netherlands' win over Ireland put them into the semis. On the men's side in Pool A France beat Scotland 3-1 to complete their three wins, while the Scots make the semis ahead of Spain on countback thanks to the games they took against the defending champions. In Pool B England beat Germany 3-1 to make sure they finished top. 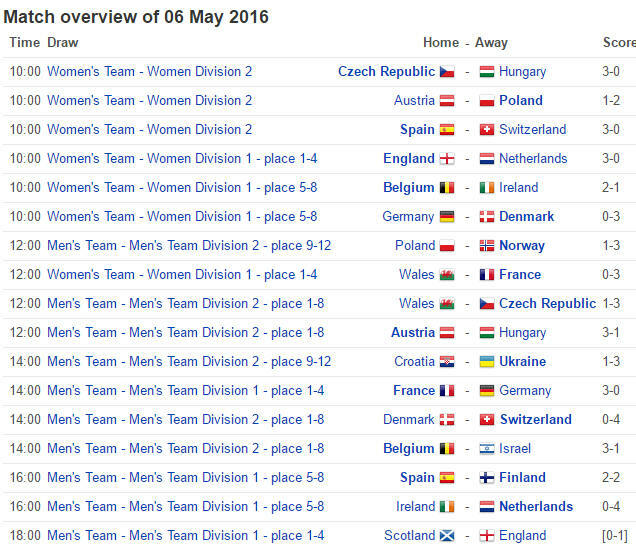 Germany ake the semis in second place following the draw between Netherlands and Finland. Meanwhile Division Two action continued with the early matches finishing off the men's pools and the quarter-finals in the evening. 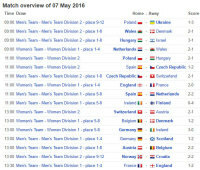 The women's round robin continued with Spain, Czech Rep. and Switzerland all remaining unbeaten. 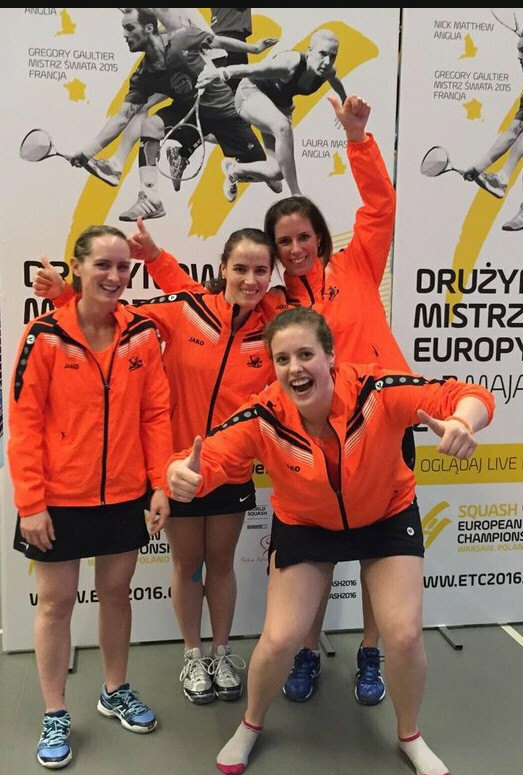 The 2016 edition of the Euro Team Champs kicked off in Warsaw with the first rounds of pool play. 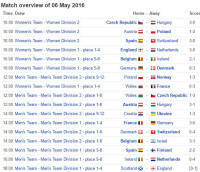 In Women's Division One top seeds England and France opened up with two wins to clinch their places in the semi-finals, as did Wales in Group A. The fourth semi-finalist will be decided in the final rounds tomorrow. 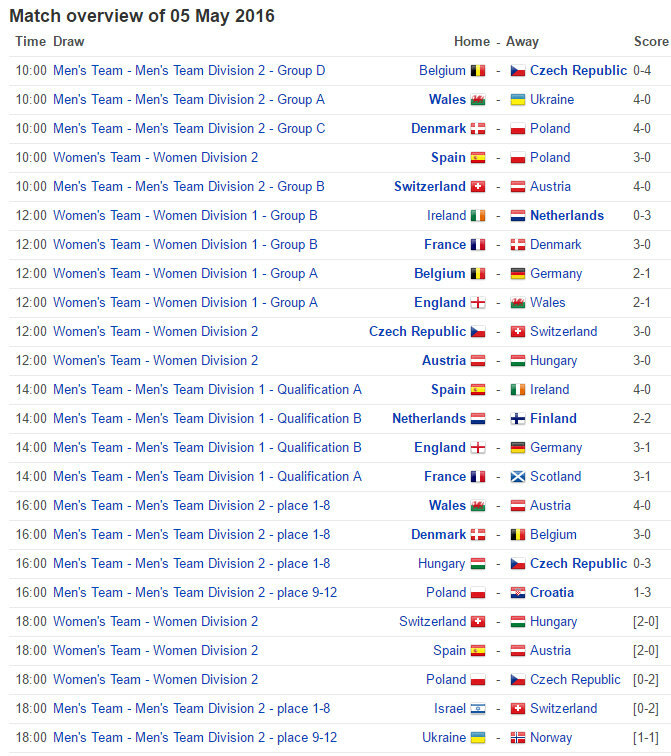 In Men's Division One it's a similar story as France and England both won both their opening matches, but after two-all draws between Scotland/Spain and Germany/Netherlands the second spot in the semis is likely to go to countback. 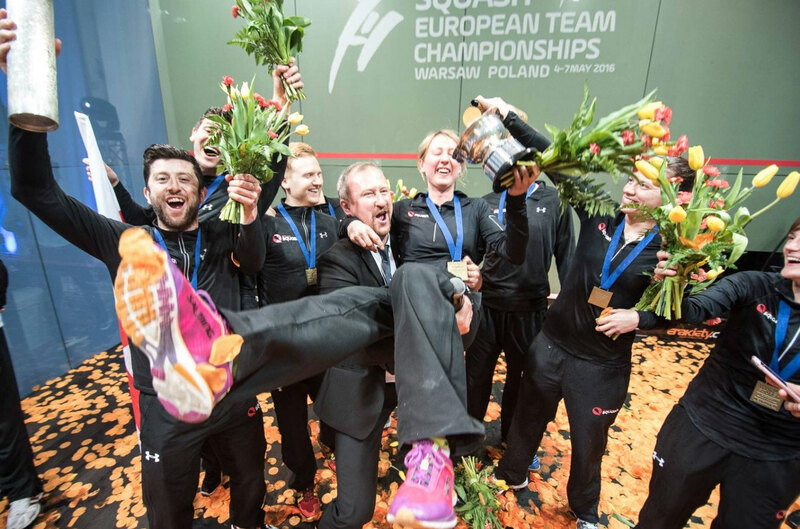 Europe's Elite players head for Poland this year as the European Team Champs take place in Warsaw from 4th to 7th May. For the first time in many years we can't use the "England seeking another double" headline, since France's men finally won the title last year in Denmark - and are seeded #1 on the back of that win, which gives the groups a probably much-needed different look. 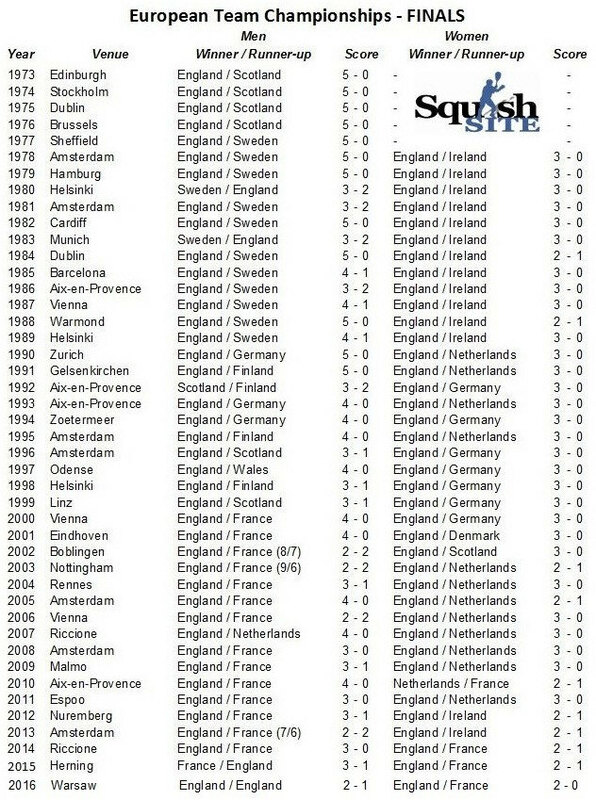 That doesn't mean that another English double is off the menu though, as their men will be desperate to regain the title they won continuously from 1993 to 2014, and their women will be looking to claim a sixth consecutive win (they've only ever failed to win once).